Female Nomades it’s our time! 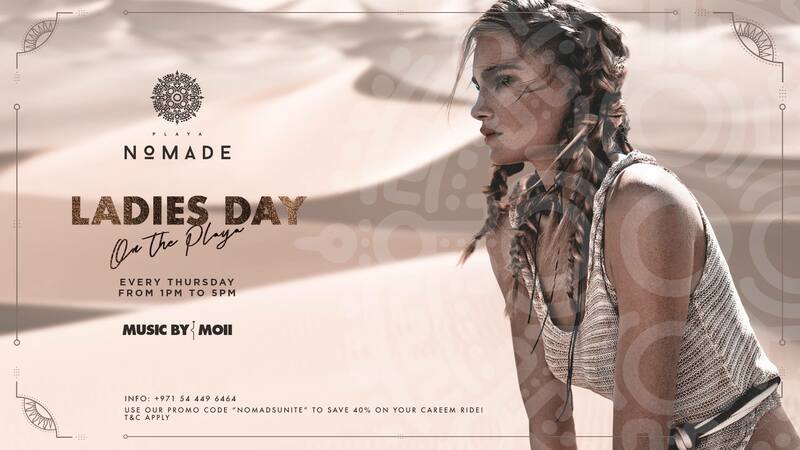 Joins us every Thursday from 1pm to 5pm for our very own Ladies Day. Come early – first 20 ladies get a free massage! Entry is AED125 for our Nomadic Emirates Cabin Crew ladies. Entry is AED150 for the wonderful Ladies of the Playa. - Upgrade #1: For AED50 more you get a 1 starter + 2 side dishes and 4 hours open bar 2 selected cocktails and sangria. - Upgrade #2: For AED100 more you get a 1 starter + 1 main + 1 side dish + 4 hours all of the above + spirits. Looking forward to having all the Playa Ladies with us on Thursday! Use our promo code “NOMADSUNITE” to save 40% on your Careem ride!